An outdoor patio deck is an excellent way to bring the value of a home up while additionally offering an excellent central point of attraction for outside activities, entertainment and relaxation, and so continue to be the most well-liked types of home improvements options homeowners choose. It remains extremely vital that you cautiously think about the designing of an outside deck. That way, you will not just have it blend in with existing designs of your house and exterior designs but you will be capable of suiting all your likes as well. That is one reason why it is important to plan the construction of you deck and go over each phase of it carefully, so that you do not forget any aspect of it. Generally, professionals designing decks will suggest that the kind of deck you design imitates and blends in with you house and other structures surrounding the home. To start with, think about the general details, materials, forms and colors that play a role in blending in with a home’s existing décor. If your house already has unique styles, this aspect of designing an outdoor patio deck is even more vital. By selecting a particular deck-type, you are capable of adding your own personal touch to the fresh, new area you are creating. You can even opt to have your outside deck connect to your house and shut the sections of the home that you and your family use most often too. This part is vital because you will have to know, ahead of time, what purposes your deck will serve you and your loved ones, or friends. If you plan to use it for celebrating special events or having a party every so often, or if you wish to use it just for family BBQ’s, you might want to add an outdoor gas grill or an outdoor kitchen island to your deck; therefore, you will need to plan for that extra space as well. Some people simply use decks to sit and relax during the weekend or after a hard day at work. Some homeowners opt to add a hot tub to their outside patio deck too, which is a great option as well. Whichever design you choose, make certain to have a clear concept of what you want while planning the construction of it, whether you do it yourself or have professionals build it. Once it is built, it would cost you more money if you wanted modifications done. Trust me on this one. I have an outdoor patio plan for the different stages of completion. Such as I want a hot tub area, but until I have enough money, I had the concrete pad poured where the hot tub will set. In the mean time I have an outdoor fire pit and some comfortable chaise lounge chairs sitting in that area. It provides a different area to sit and it doesn’t look like some unfinished project. A trend exists amongst DIY fanatics, regarding building decks that are too big and; therefore, it is vital to prepare accordingly and select the proper shape and size, as well as style of your outdoor patio deck. 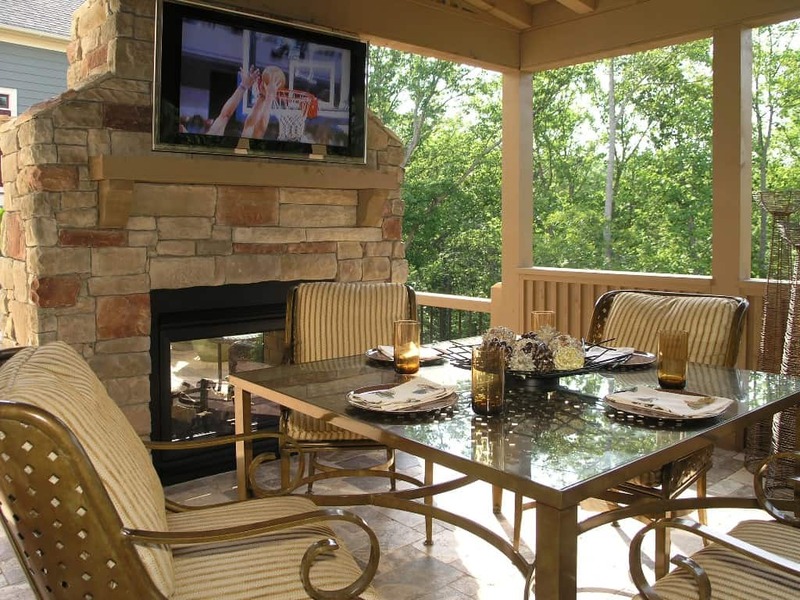 If you determine all the purposes of your deck beforehand, your designing will go smoother and quicker and you will not need to re-design it later or have adjustments made either, and you will know ahead of time how much space you will want and need, for additional activities or items like an outdoor kitchen with an upgraded gas grill, for example. Regarding outside decks, the wood used for them gives you two options, ones normally used that is. You can choose Redwood, which is a type of wood with a straight grain and it comes in a variety of shades, from lighter red to darker red. Coating this kind of wood is additionally simple. Another popular type of exterior deck wood is Heartwood Redwood, which is additionally durable and resists things like insect and will not deteriorate or rot easily. Even though it costs more than most types, at prices close to four times the amount of some woods that are pressure treated (specifically for outside decking use), it nonetheless comes with its own benefits. You can make a compromise by putting the Redwood in areas where people will see it and you can use the pressure treated Heartwood Redwood in areas where it is not going to be as visible, like beneath the patio deck. An additional type of wood used for outdoor decks is Red-Cedar Heartwood, which has many similar advantages, just the same as Redwood does; however, it is not as dark in shade and is light red. In addition, this type of wood is additionally simpler to use. If you want more durable and exotic-type wood, one that requires less maintenance, there are additional options available nowadays. Ironwood, Walnut, Pau Lope and Brazilian are just a few of the choices you have today. They are extremely striking, the same as it is with Teak Wood, Philippine Mahogany and Brazilian Cherry Wood. The benefits of working with these types of exterior deck wood are that they tend to be thicker and richer, made with all-natural oils, which indicates that they are additionally resistant to deterioration, bacteria and fungi development, insects and fire exceptionally fine. One of the things I most enjoy on my deck is my portable fire pit. I can position it in the center of a circle of friends or just have it near where we sitting having dinner outside on cool evenings. As with most things regarding building at home, there is one vital item to do before building your outside patio. You will need to get permission and adequate permits from your local town before you construct the deck. The majority of town halls mandate building permits. The town office will evaluate your deck blue prints, which you will be required to submit to them when requesting the permit. Your design plans need to go in accordance with any town or city codes for your area and state. Permits for building any structure on your land, including an outdoor patio deck, are generally received from the code enforcement officer for you town or city, and if you plan to add space for an outdoor kitchen island make sure this information is on your design plan when presenting it to the City or if you have to submit your plans to your homeowners association for approval also.